A designer before my time….. 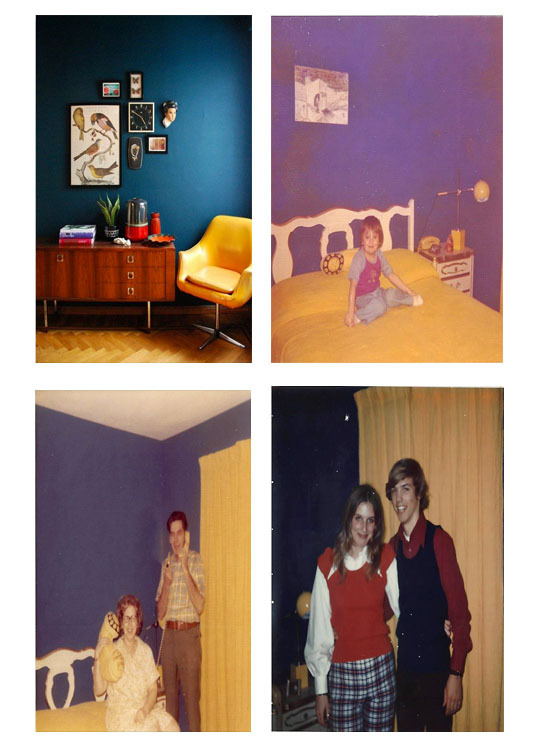 The Novogratz design family posted the upper left photo in this collage on facebook this week and I immediately thought about my bedroom when I was 16 years old back in the 70’s. I begged my parents to let me pick the colors and paint all by myself. I am pretty sure the carpet which was the exact color of the walls (dark navy blue) was never the same. These photos are VERY old so the quality is not very good but I sure had a good laugh when I looked at them. Notice the yellow princess phone and the matching yellow pillow. One of those pictures is my little nephew who is not so little these days and another is my parents. And yes, that is my sixteen year old self with a friend….some of you may recognize that guy!!! Wow…look at those fancy pants I have on. Thanks Novogratz for the memories!